Recode Knoxville: Public notice or PR piece? 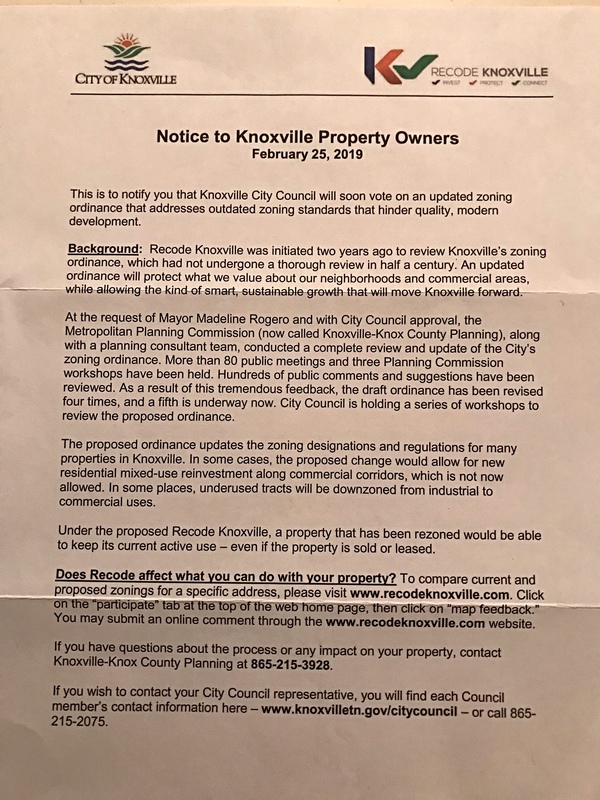 Among the issues surrounding Recode is the adequacy of the recent public notice mailed out to property owners of record in the city of Knoxville. Council requested that such notice be given, but it did not specify or control the content of the notice. Recode affects every tract of land in the city (73,000 parcels). Their property and their neighbors’ property may be impacted; indeed, their entire neighborhood is subject to different influences. A proper warning should inform the recipient that prompt action is required to protect their interests. No one wants angry citizens to wake up later only to find out their ox has been gored while they slept in quiet ignorance of mischievous lawmaking down at city hall. The question is where are we headed? Public notice or PR piece? On Feb. 25, the city mailed out a one-page, unsigned notice to all Knoxville property owners of record. It told them how the city was modernizing its “outdated zoning standards” that “hinder quality, modern development,” and informed them that, should they have any questions after studying the Recode website (you know, the 287-page draft document and related zoning maps), they should contact the planning department or their city council representatives. 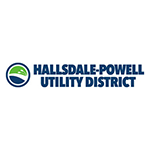 The cost of that mail out is believed to be in excess of $20,000, according to a supplemental appropriation presented by Finance Director Jim York last week. What else did the notice say? The one-page memo/letter states that “Knoxville’s zoning ordinance had not undergone a thorough review in a half a century,” and opines that: “an updated ordinance will protect what we value about our neighborhoods and commercial areas, while allowing the kind of smart, sustainable growth that will move Knoxville forward.” (Emphasis added). Geepers, who could be against that? It gushes of motherhood and apple pie. In fairness, toward the bottom of the page, the notice does ask you to consider whether “Recode affects what you can do with your property,” and directs you to examine the Recode website and/or make the clarify calls for answers. But you are on your own to figure out what this means. The good news is that existing lawful uses are grandfathered under state law. But future change is open-ended. This notice was crafted by deputy mayor Bill Lyons and head planner Gerald Green. Was the equivalent ever said here? No, you are told instead this Recode thing is supposed “to protect neighborhoods” and enable “smart, sustainable growth” to move Knoxville forward. Why would you call anyone about that? It seems wholesome. Why not tell them: Recode will probably affect your property and the uses which your neighbor can make of theirs; and that, over time, it may change the character of your neighborhood. It should have issued a warning cry: Speak now or forever hold your peace. The New Urban Vision? Recode is more than a long-delayed edit of an outdated document, with modern illustrations and better organization. Of course, it does some of that. But there is clearly a higher density preference. A “new urbanism” with multiple family housing near bus routes, more duplexes and four-plexes allowed, and even accessory dwelling units possible on every residential lot. This “urban vision” is not confined to inner-city neighborhoods, which have experienced rehabilitation by urban pioneers over the past 20 years. It includes potentially greater density throughout the city, even in suburban neighborhoods where citizens invested hard-earned dollars and planted roots around a home in a single-family neighborhood. Some of ideas are good, of course. But it seems that Knoxville’s historic suburban growth pattern is not cherished. It apparently needs fixing. This may stem from the administration’s progressive vision. Or it might be anti-sprawl. Perhaps that vision is shared by the planners and city council members, some of whom are urban pioneers in their own right. Who ordered the change? This might be grand, or it might not. The vision is incorporated in Recode as a fait accompli; hardly discussed by the planners and quietly introduced by the administration through its Chicago consultants. Hmm? It raises real questions. Do we want top-down government planning? Or do we prefer citizen-initiated choice? Hopefully, the city council will grapple with this conundrum. Shouldn’t the public notice have disclosed the inherent bias in Recode? Was its reference to “smart, sustainable growth” enough to awaken the conscience and move you to action? Conclusion. Citizens need to keep attuned to this technical but important process. By their nature, zoning ordinances tend to be densely worded (replete with defined terms and legalese). They can be difficult to read without a clear frame of reference to the issues. We need to try. We are writing a road map to Knoxville’s future. Citizens need to ask their elected representatives pertinent questions, and to charge them with preserving what we believe is good about existing neighborhoods.